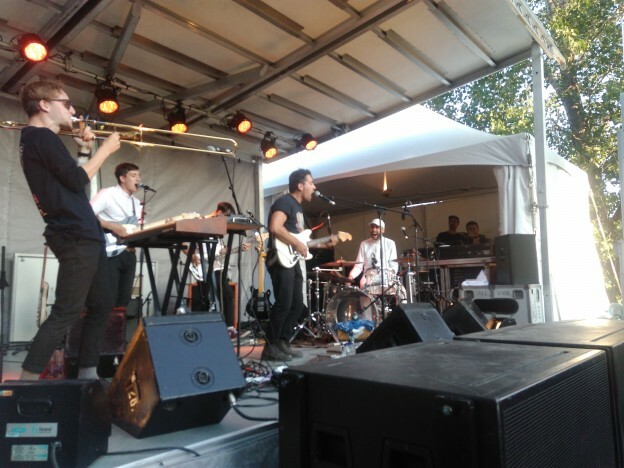 The first edition of the Mile Ex End Festival took place Saturday, September 2nd and Sunday, September 3rd under Montreal’s Van Horne Viaduct. I was excited for the festival because the same space used to host some very fun block parties many years ago – a revival of the Van Horne Viaduct seemed to me like a great idea. As I walked into the festival site early Saturday afternoon, I noticed there were not many attendees there yet, just staff and media. There were three stages, one very large and two smaller ones, food trucks, an art gallery and a kid zone. The atmosphere was relaxed, family-friendly – it felt like an end of summer celebration. Of the smaller bands playing the festival, local psych rock band Adam Strangler was a clear stand out. They started their set off with a very upbeat and friendly stage presence despite the small crowd on Saturday afternoon, the sound techs cheering them on. Before long, people started to pour in and joined in the applause. Adam Strangler played all the tracks off their great EP, Key West, as well as some hooky songs that were new to me, but very enjoyable to listen to in the Saturday sunshine. Later that day, the young members of Foreign Diplomats also gave a high energy performance, calling on the audience to sing and dance like no one was watching. Their catchy indie pop songs were punctuated with alternating synths and trombone melodies, accentuating the festive atmosphere. Beyond these excellent openers, Mile Ex End also had some impressive headliners. The crowd was eager to see Cat Power perform Saturday night, filling up the space in front of the smaller Mile End stage long before her set time. A smoke machine (whether intentionally or by accident, I’m not sure) spewed out smoke continuously before her set, shrouding everyone in comforting fog. When Power took the stage – alone, except for her guitar and piano – all lights and eyes were on her. Her first notes caused goosebumps to quiver up and down my body, reminding me just how much her music affects me. The whole set was powerful and emotionally charged – her voice has only gotten more beautiful and husky with time. Cloudy skies and a weaker lineup made Sunday less exciting than Mile Ex End’s first day. But that evening’s headliner, Montreal’s own Godspeed You! Black Emperor, were easily a festival highlight. They opened with “Hope Drone,” as their notoriously haunting visuals of abandoned buildings and train tracks looping in the background. I wish I could enumerate each song Godspeed played, but they fold so well one into the other that it sort of defeats the point to try and single them out – just being able to experience them in the moment is pure joy. They must have been playing songs off their not-yet-released new album Luciferian Towers, however, because there were definitely parts I did not recognize. Though they played new tunes, Godspeed certainly haven’t steered away from their old political messages; judging by their frenzied crescendos and violent protest visuals (as well as the titles of their new singles – “Bosses Hang” and “Anthem For No State,”) they’re more enraged with the status quo than ever. After the band’s 2011 revival, it was nice to see that they are still going strong, creating new music and moving people with their uniquely haunting orchestral pieces. Mile Ex End certainly provided a platform for some really lovely music, local and otherwise. Speaking to a few artists throughout the weekend, I also got the impression that they were very happy with the well-staffed and highly-organized festival. But the festival definitely has room to adjust going forward. The site felt too large for the number of attendees – two alternating stages would have sufficed. Indeed, while Godspeed performed I kept thinking back to when they used to play to cross-legged audiences in dumpy Montreal jam spaces in the nineties, a memory I only live vicariously through my older friends. I wondered what it would be like to experience them in a smaller, more intimate setting rather than on such a large stage amongst so many other humans. The size of the site might not be such an issue in the future if the festival lowers its prices, which are currently inaccessible for lower-income people, and widens its scope – this edition of Mile Ex End showcased mostly white artists of mostly similar genres. I saw some fantastic rock at this festival, but, despite all the space, I left feeling like Mile Ex End’s first outing was, in some ways, just too narrow. This entry was posted in Reviews and tagged adam strangler, cat power, ckut, foreign diplomats, Godspeed you! black Emperor, mile ex end on September 13, 2017 by librarian.